Electrolytes play a vital role in maintaining homeostasis within the body. Electrolytes help to regulate myocardial and neurological functions, fluid balance, oxygen delivery, acid–base balance, and much more. The most serious electrolyte disturbances involve abnormalities in the levels of sodium, potassium, and/or calcium. Kidneys work to keep the electrolyte concentrations in the blood constant despite changes in the body. sodium: A chemical element with symbol Na (from Latin: natrium) and atomic number 11. It is a soft, silvery white, highly reactive metal and is a member of the alkali metals. Electrolytes play a vital role in maintaining homeostasis within the body. They help regulate myocardial and neurological function, fluid balance, oxygen delivery, acid-base balance, and other biological processes. Electrolytes are important because they are what cells (especially those of the nerve, heart, and muscle ) use to maintain voltages across their cell membranes and to carry electrical impulses (nerve impulses, muscle contractions) across themselves and to other cells. Electrolyte imbalances can develop from excessive or diminished ingestion and from the excessive or diminished elimination of an electrolyte. The most common cause of electrolyte disturbances is renal failure. The most serious electrolyte disturbances involve abnormalities in the levels of sodium, potassium, and/or calcium. Other electrolyte imbalances are less common, and often occur in conjunction with major electrolyte changes. Chronic laxative abuse or severe diarrhea or vomiting (gastroenteritis) can lead to electrolyte disturbances combined with dehydration. People suffering from bulimia or anorexia nervosa are especially at high risk for an electrolyte imbalance. Kidneys work to keep the electrolyte concentrations in blood constant despite changes in your body. For example, during heavy exercise electrolytes are lost through sweating, particularly sodium and potassium, and sweating can increase the need for electrolyte (salt) replacement. It is necessary to replace these electrolytes to keep their concentrations in the body fluids constant. Hypotonic or hyponatremic (primarily a loss of electrolytes, sodium in particular). Hypertonic or hypernatremic (primarily a loss of water). Isotonic or isonatremic (an equal loss of water and electrolytes). In humans, the most common type of dehydration by far is isotonic (isonatraemic) dehydration; which effectively equates with hypovolemia; but the distinction of isotonic from hypotonic or hypertonic dehydration may be important when treating people with dehydration. Physiologically, and despite the name, dehydration does not simply mean loss of water, as both water and solutes (mainly sodium) are usually lost in roughly equal quantities as to how they exist in blood plasma. In hypotonic dehydration, intravascular water shifts to the extravascular space and exaggerates the intravascular volume depletion for a given amount of total body water loss. Neurological complications can occur in hypotonic and hypertonic states. The former can lead to seizures, while the latter can lead to osmotic cerebral edema upon rapid rehydration. In more severe cases, the correction of a dehydrated state is accomplished by the replenishment of necessary water and electrolytes (through oral rehydration therapy or fluid replacement by intravenous therapy). As oral rehydration is less painful, less invasive, less expensive, and easier to provide, it is the treatment of choice for mild dehydration. Solutions used for intravenous rehydration must be isotonic or hypotonic. 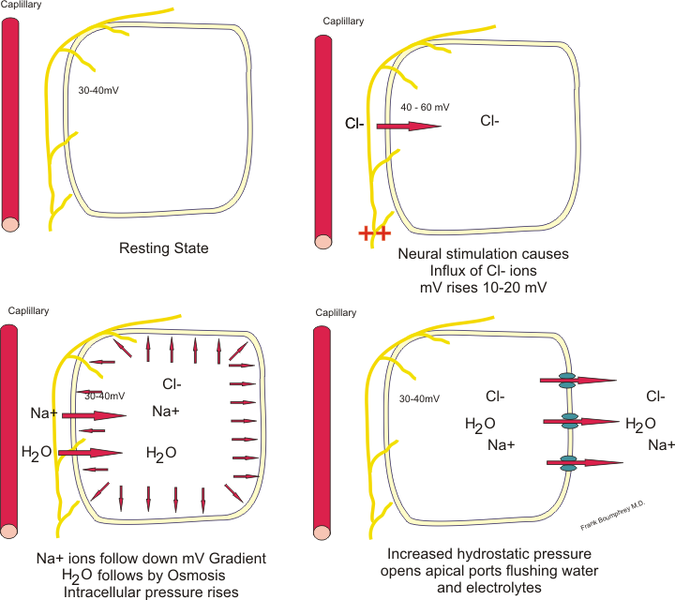 Cell electrolytes: This diagram illustrates the mechanism for the transportation of water and electrolytes across the epithelial cells in the secretory glands.